This is a 1900 Waterman 20 eyedropper-fill in Red Mottled Hard Rubber. 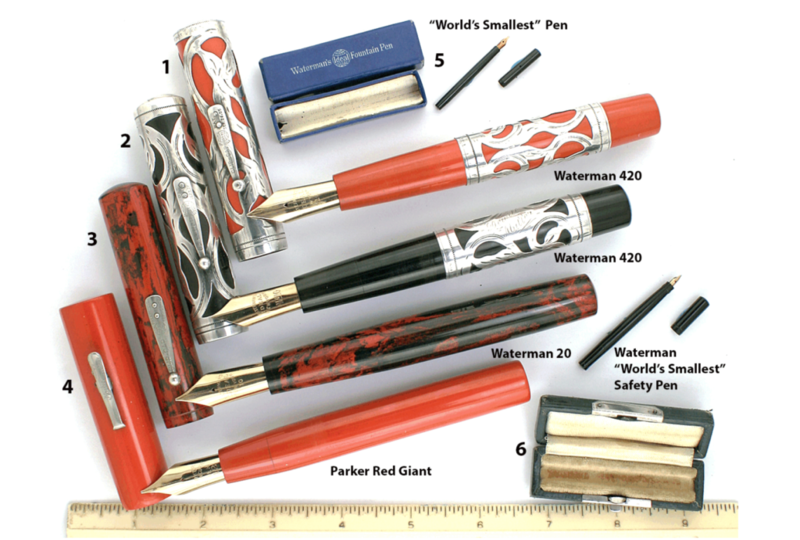 Huge pens were a vouge at the time; there was the Parker Giant, the Parker Ultra Giant, the Dunn Giant, the Montblanc 12 Safety, the Moore 10 Safety and the Waterman 20 (cone cap and Safety). This example is in wonderful condition, with just a little imprint wear to the center and third line of the barrel imprint (otherwise near mint). The mottled 20 is far, far rarer than the Black Hard Rubber (smooth or chased) models. Huge No. 10 nib (medium/broad). Check out our Catalog to view this item’s availability! Item #3 in Catalog #86.